Round trip in Andalucia. Starting in Seville, fist crosses the Aracena Mountains, to later on turn South and follow the coastline until Doñana and San Lucar de Barrameda. A very nice trip that can be done even in wintertime (we did in X-mass). Ruta que parte de Sevilla y que discurre en su mayor parte por la provincia de Huelva. Pirmero por la Sierra de Aracena para despues bajar y bordeando la costa llegar hasta la desembocadura del Guadalquivir cruzando Doñana por la playa y en Barcaza a San Lucar. A six day ride across Switzerland from Basel to Zernez in the Lower Engadine, taking in some of the easier passes including the Glaubenbielen Pass, the Pragel Pass, the Wolfgang Pass and the Fluela Pass. A tandem tour of the Alps, starting from Munich, then riding through Austria, Switzerland, and Italy. Another tour of the Alps for this Summer was being planned, but nearly had to be cancelled due to an accident in early June, when I fractured my collar bone and hurt my head and right leg. I had the goal of completing climbing all asphalted pass roads in the Alps from 1700m and higher (which I have detailed in a list at the cycloclimbing.com site). My memoir of riding the Paris-Brest-Paris 1200 km Randonnee in 1995 - a day-to-day dairy, plus a bit of history and an equipment list. 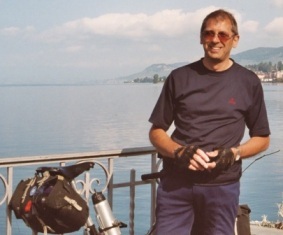 At the end of August in 2008, Mike Samuel, Roberto Peon and I toured across France, starting in Hendaye on the Spanish border, and then riding across the Pyrenees to the Mediterranean coast. There, we took a train transfer to Montpellier, and then rode North through Languedoc, Provence, and the Rhone Alps to Bourg-en-Bresse and then Geneva. The journey totaled 1047 miles with 92949 feet of elevation gain. Looking for the real Iceland: a 23-day bicycle tour around the land of fire, ice and puffins. We rode through the West Fjords and clockwise around Route 1 (the Ring Road). We did not traverse the interior, but the journey was hard enough. The weather forecast for the next week looks promising, so I decide to take the train to Geneva, and start a cycle tour crossing Switzerland diagonally till St. Margrethen (at the Austrian border). Rika (my sister) bought an e-bike, so we want to test it. I hope that after 4000 kilometres ride, I will get to know the pros and cons of electrically assisted bicycles. In the morning we cycle to Waldshut, our starting point for our trip around Germany. I take a photo of the bridge over the Rhine in Waldshut and hope to be back here in 6-7 beautiful and exciting weeks. From Waldshut to Schluchsee we have to climb approximately 600 meters. As long as the ground is flat, I can keep up with the e-bike but if it gets steep, I cannot keep the pace. We decide that both of us cycle our own speed. If Rika arrives at the top of a hill, she will have to wait until I reach the top of the mountain. Until now it was vice versa. An account of a 6 day bike/tandem tour based in Arabba at the foot of the Passo Pordoi in September 2009. Includes daily ride reports, route maps, lots of photos and details on how we got there - and how we got on! The rides include ascents of the following passes... Passo Giau, Falzarego, Pordoi, Sella, Gardena, Campolongo, Valparola, Tre Croci, Tre Cime di Lavaredo, Duran and Staulanza. 4 of us toured Hokkaido, starting from Chitose, over to the North East Section and return. We visited several National Parks along the way, and many hot springs. But the main attraction was the Japanese people and their friendliness. A six-day tour from Thessaloniki to Athens in Greece. 637km cycled, stopping in Thessaloniki, Katerini-Paralia, Larissa, Lamia, Delphi and Thiva. The highlight was definitely the hills and archaeological sites around Delphi, but we loved dodging the wild dogs, chatting with priests and lapping up Greek Salad every day. Greece doesn't seem used to recreational cyclists, but it offers many spectacular views and challenging hills, and we encountered a warm welcome and considerate driving everywhere (even in Athens!). 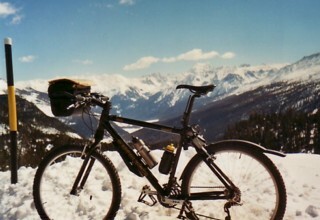 A short and relaxed biketour from Nauders to Brescia in Fall 2008 thru beautifull Vinschgau. This was a five-day bicycle trip to various Chateaus in the Loire Valley, using Tours as a base. Following that, a few days sightseeing in Paris, sans bicycle. A five day cycle trip across Switzerland starting at Geneva following Swiss bike route 1 up the Rhone valley to the Furka pass, then joining route 3 over the Gotthard pass with a super long descent to Bellnzona, and finishing up on the western shore of Lake Como in Italy. With a bus lift over the Furka this was an easy way to cycle in the heart of the Alps and time was taken along the way to stop and meet people and visit some of the castles on the route. With nearly 100 photos this is a day by day account of the journey, the people I met and places I visited along the way. Primavera (spanisch for spring) with our bicycles in lusciuos green Andalusia. Amazing how many flowers we saw and how quiet it gets if your off the beaten tracks. We crossed the Sierra Nevada, Sierra de Segura and the Sierra the Carzorla. Wonderful! We slept in b&b's but most of the time we camped on campings an also in the wild. Enjoy the video-report. Three fledgling cyclists, Liz, Nix and Mal, pimp their £400 bikes and invest in wooly jumpers to cycle across France coast to coast from St Malo on the English Channel to Sete on the Med. 3 bods, 3 bikes, 14 days cycling, 2 days resting, 1100 km, 700 miles and 0 punctures! What follows is the journal of the ride seen from our saddles. It hopes to be informative to those who dare, and reflective for those who like the highs and lows of the human story. Each day has a detailed google map of the route we took, pics, contact details of the place we stayed, and of course the journals of Liz, Mal and Nix. Oh and when we calculate our daily speed we're basing it on the length of the complete day with our breaks - this was a challenge with no time for long lunches or relaxing strolls on cycling days. In the first week of June 2002, I cycled with my brother on a pilgrimage to Santiago de Compostela. He started from Le Puy, France, and after he'd been on the road for 750 miles, and two weeks, I met him at Sahagun, near Leon, Spain, to cycle the remaining 250 miles to Santiago. This is an account of my journey, and the preparations for it. 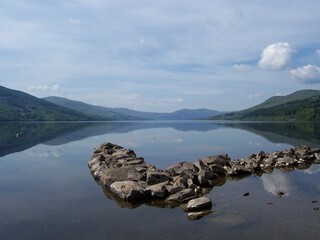 I have gone into detail about some aspects, which may help anyone else travelling the route. The journey was to be a pilgrimage, so as well as preparing the bike, and getting myself physically fit, I felt I needed some spiritual preparation. My parish, St Joseph's, Pudsey, was running an Open Retreat in Lent, where instead of going away for a retreat for a day or a weekend, you go for a couple of hours, once a week, for six weeks. I found this period of prayer and reflection very helpful; over the weeks, the support of other members of group was most welcome. A 9 day bicycle tour through Switzerland, originating from a ski climb to a 4000 m peak. Here is how it works: you go around by bicycle and, from time to time, your friends reach you to perform some ski ascent together. It is understood that the whole mountaineering gear is carried by them! Viene qui descritto il tratto che va da Hochbrucke fino a Brunsbuttel. Una sessantina di chilometri lungo il canale, quasi una crociera, e una ottantina di chilometri risultanti da una escursione allâ'interno. Nato dopo quello di Suez, lo solcano più di 40.000 imbarcazioni ogni anno e presenta grandi opere a corredo, ponti e porti, strutture possenti realizzate per renderlo attivo. 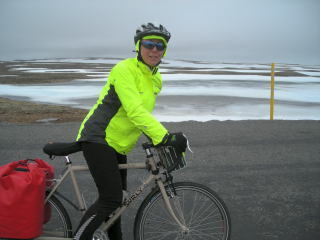 Upcoming winter cycling expedition of Iceland in February - March 2010. Follow the updates section during expedition time for daily tour report, stats and images. This will be the first known, solo and fully self-supported winter cycling expedition of Iceland. A leisurely tour in Tuscany, just two weeks but time enough for a flirt with its hills without getting too involved. We have fun cycling the streets of Florence, Pisa and Lucca, take our time visiting Medici villas and Renaissance gardens and get lovely views of the Tuscan countryside in the spring. Our first tour of the season takes us to Franconia. Franconia? Sounds like a place from a Marx Brothers film. Remember ``Duck Soup'' and the land of Freedonia? On the German map it's called Franken and is a wonderful place to cycle in the pre-Easter season, if the weather is right. And it was. The countryside was just turning green and the villages were decorated with beautifully crafted, traditional Easter wreaths. We cycled from Nuremberg to Heidelberg and then followed the Altmühl Bike Path to Kelheim.